Baker Hall is an acoustically superior 1,014-seat performance hall, suitable for concerts, stage productions, ceremonies, lectures and more. 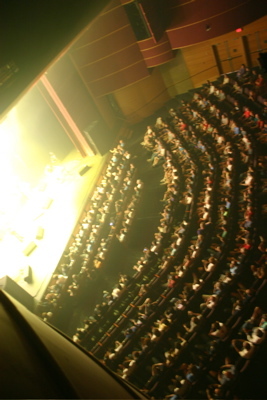 The stage can be modified to accommodate theatrical productions of different sizes and types, shifting from "theatrical" with a bare stage to "concert" with an orchestra shell that creates outstanding acoustics within the hall. High-speed internet access is available. Click on these links to view or download a PDF of either a ground plan or section. Click on these links to download a VectorWorks file of either a ground plan or section. Click on this link to download a PDF file of the repertory lightplot. Click on this link to contact the Production Manager.